The REMUS-100 is an unmanned undersea vehicle used for detection of mines. Image courtesy Kongsberg Maritime. REMUS-100 is easy to operate, as it does not need any special equipment to launch and retrieve the vehicle. Image courtesy Kongsberg Maritime. REMUS 100 is easy to operate as it requires no special equipment to retrieve the vehicle, Image courtesy Kongsberg Maritime. REMUS-100 is small in size and light in weight. Image courtesy of US Navy. Members of the Royal New Zealand Navy Operational Dive Team deploy autonomous underwater vehicle Remote Environmental Measuring Units (REMUS) during the International Mine Countermeasures Exercise. Image courtesy of US Navy. 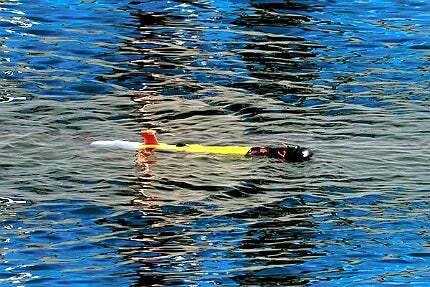 Remote Environmental Measuring Units (REMUS)-100 are light and compact AUVs (Automatic Underwater Vehicles) designed by the Woods Hole Oceanographic Institution (WHOI). The vehicle is being manufactured by Hydroid, a wholly-owned subsidiary of Kongsberg Maritime. The REMUS-100 is primarily used in marine research, defence, hydrographic and offshore energy applications. It can be used in a range of missions, including mine countermeasures, harbour security, debris field mapping, search and salvage, hydrographic surveys, environmental monitoring, fishery operations and scientific sampling and mapping. The REMUS-100 AUV was first deployed by the US Navy mine warfare elements in March 2003 in the Northern Arabian Gulf. Hydroid launched the REMUS 100-S, an improved version of REMUS 100, in February 2012. The variant features advanced sensors and navigation systems. More than 200 REMUS 100 vehicles are operational around the world. The Federal Office of Defence Technology & Procurement (BWB) placed an order for six REMUS 100 vehicles in October 2012. Deliveries and training programmes will continue until October 2013. The Royal Norwegian Navy (RNoN) ordered four REMUS 100 systems in April 2012. Hydroid delivered four REMUS 100 AUVs to the Japanese Ministry of Defence (MOD) in the same month of 2012. In February 2012, the Belgian Navy placed an order with Hydroid for two REMUS 100 AUVs, bringing its REMUS 100 fleet to three. "The REMUS-100 AUV was first deployed by the US Navy mine warfare elements in March 2003 in the Northern Arabian Gulf." REMUS-100 carries a variety of payloads despite its small size. The vehicle features Acoustic Doppler Current Profiling (ADCP) to measure the water stream velocity using the Doppler Effect of water waves. The side-scan sonar aboard the vehicle creates an image of the underwater surface. The video of the mission is recorded by a video camera with a light bar. REMUS-100 also carries Long Baseline Navigation (LBL) and Dead Reckoning Accuracies for navigation. The Conductivity and Temperature sensors measure the conductivity and temperature of the water around the vehicle, while the same data is stored in the hard drive of the vehicle. The data will be used to determine the speed of sound in the water, to increase the accuracy of navigation. The Heading, Roll and Pitch sensors of the REMUS-100 determine the orientation and position of the vehicle for ascertaining the distance of the vehicle from the transponder. The Bathymetry sensors are used to measure the depth of water. The REMUS-100 is fitted with Environmental Characterisation Optics (ECO) sensors to map the environment of the area being inspected. The vehicle also integrates other sensors for measuring dissolved Oxygen, ORP (Oxidation Reduction Potential) and pH levels of water. REMUS 100 can navigate using different methods. The system navigates using the Long Base Line (LBL) method supported by the transponders provided along with the system. The transponders are placed in the boundaries of the working area where the vehicle is scheduled to move. The transponders act as reference points for the determination of the position under the water. "In February 2012, the Belgian Navy placed an order with Hydroid for two REMUS 100 AUVs, bringing its REMUS 100 fleet to three." The Dead Reckoning (DR) solution is also used along with the LBL to navigate the vehicle. The computer considers both LBL and dead reckoning, and automatically determines the better method. The vehicle communicates with single reference transponder and determines its distance from the transponder using the USBL (Ultra Short Base Line) navigation method. The information is used along with the vehicle’s pitch, roll and heading information to determine the accurate position of the vehicle. The REMUS 100 also navigates using Acoustic Doppler Current Profiler (ADCP), which measures water stream velocities and Doppler Effect of sound waves from particles within the water column. The data is combined with Dead Reckoning (DR) for the navigation. In this method the vehicle comes to the surface at regular intervals for GPS fixes. The vehicle can also navigate with the aid of inertial navigation system using the velocity and orientation of the vehicle to calculate the position of the vehicle via dead reckoning. The Post Mission Analysis (PMA) software suite supports navigation processing, bathymetry processing, layering to chart, 3D view, side scan sonar processing and target recognition. The REMUS-100 system uses three types of communication. The acoustic communication is used by the vehicle to communicate under water with transponders and transducers. The Wi-Fi communication is used to establish communication between the computer and the vehicle while downloading the recorded data from the vehicle. The data can also be downloaded to several computers simultaneously with serial links and Ethernet link. The Iridium communication is used for communication through satellite. The compact dimensions and light weight of the REMUS 100 ensure the carriage with ease. The vehicle can be easily deployed as it requires no special devices for positioning and retrieving. REMUS 100 can be programmed to operate at a speed of 5kt and can withstand strong currents. It can be operated with minimal specialised training. The Vehicle Interface Programme (VIP) makes it easy for anyone to operate the vehicle with the help of simple training for a few hours. The REMUS 100 also features an emergency transponder known as REMUS Ranger. It includes a deck unit linked with a Towfish towed transducer. The system allows the user to communicate with the vehicle while the mission is going on. Ranger features a front display which displays information about the range of vehicle. It also executes emergency commands such as "Abort mission" and "Come home". The towed transducer of the Ranger unit receives broad range of signals from the AUV and transponders, and carries them to the Ranger unit. The REMUS 100 AUV is powered by a Direct drive DC brushless motor, driving an open three-bladed propeller. The lithium ion-based internally rechargeable batteries provide power for the onboard systems. The Skjold Class missile fast patrol boat is characterised by its speed, reduced signatures, small size with heavy weapon load and its littoral combat capability.